Karen Hampton ‘Rendir’ 2016. Image courtesy of Jack Bell Gallery. Despite what might be going on behind the scenes, to the gallery-going public August in London means down-time on the gallery circuit. Many quality, big name galleries fill this gap with group shows which, to the regular visitor, can seem like the weakest link in an otherwise strong calendar of exhibitions. For smaller galleries looking to build an audience however, it’s as good a time as any to offer an overview of the artists they represent. The group show, ‘Le Penseur’ at Jack Bell Gallery, a bright and tidy space behind White Cube in Masons Yard, provides a neat introduction to some of the Gallery’s stable of artists. The space is a nice surprise at the top of an unexotic flight of stairs in one of the narrow townhouses on the square. It contrasts modestly with the colossal cavity block that is the White Cube. Indeed, this whole area, according to the new Mayfair & St James’s Gallery Map, which shows what I estimate at 150+ galleries, is a densely packed hub where old, ageing, and new spaces coexist. It’s encouraging to see surprisingly fresh work being shown in some of the smaller galleries in this area, in the middle of so much Polo and Aquascutum. All of the work in ‘Le Penseur’ is by African artists, with the exception of a piece by the American artist Karen Hampton, who is based in LA. Whilst photography features lightly, with small works by Leonce Raphael Agbodjelou, from Benin, (see my post of July 13th: theglazelondon – Leonce Raphael Agbodjelou) and Hamidou Maiga (Born in 1932 in Bobodioulasso, Burkina Faso, but mainly known for photographing the people of Mali), much of the painting in the show bears evidence of photography having influenced its production, either directly or indirectly. Armand Bouas’ paintings of street life in Abidjan have an archival feel making them resemble colossal hand-coloured negatives. Boua’s process involves applying paint to thick pieces of cardboard and then stripping the image back through scraping and washing away parts of the accumulations of layers of paint. The result is high contrast semi abstraction. These are entirely works from the street, from the restless groups of children which are Bouas’ main subjects to the earthen colour schemes and dust blown surfaces of the paintings. On a large scale, pinned to the pristine gallery wall by magnets, these paintings have a powerful physical presence, down to the slightly musty smell of dried and crumbling paint. They sit unevenly against the wall, like frescoes rescued from a ruined building. In fact, the faint smell of paint hits you at the top of the stairs as you approach the door of the gallery space. As much as this could be a slow-release effect of Bouas’ distressed surfaces, it could equally be from the thick, oily surfaces of Aboudias’ paintings. Aboudia, from Ivory Coast, makes paintings that teem with what, on first appearance, looks like playful cartoonish iconography. There is a graphic quality to the motifs, which are generously applied to the surface or ‘drawn’ with oil bar. They are superficially reminiscent of Basquiat. Aboudias’ surfaces are far denser than Basquiats’ however. Lines loop and interact. Shapes jostle past each other like shoppers at a busy market. The interactions are hardly benign. The rough pop aesthetic which oil pastel tends to produce distracts temporarily from the menace at the heart of the subject matter. Aboudia paints from his experiences of the second Ivorian civil war, which erupted in 2011. Gonçalo Mabunda, Untitled Mask 2015. Image courtesy of Jack Bell Gallery. It is striking, but should hardly be surprising, that war has marked so much of the work on display. Gonçalo Mabunda, from Mozambique, produces furniture and sculpture from decommissioned armaments recovered in 1992 following sixteen years of conflict. Mabunda’s series of wall mounted masks brilliantly exploit the anthropomorphic effect of reconfiguring fragments of these once deadly weapons to create masks. They mimic perversely the kind of African statuary Western collectors have clamoured over since Picasso’s tribal epiphany at the Ethnographic Museum in Paris in 1907. On the largest wall in the gallery, a selection of work has been hung in a tightly stacked arrangement, as in a summer salon. Despite the differences between the individual artists’ work, the arrangement is well balanced. This could be due to the techniques of layering which seem to be common to almost all of the painters in the show which is evident in how they deal with their motifs. Boris Nzebos’ hard edge, multi-layered street scenes however strike a superficially light tone by comparison with the other painters. Of all the work in the show, Nzebos’ canvasses seem committed to looking forward instead of reflecting on the dark events of the recent past. Karen Hampton was born in Los Angeles, and is the only artist in the show who is working from a vantage point which is beyond the direct influence of contemporary day to day events in Africa. 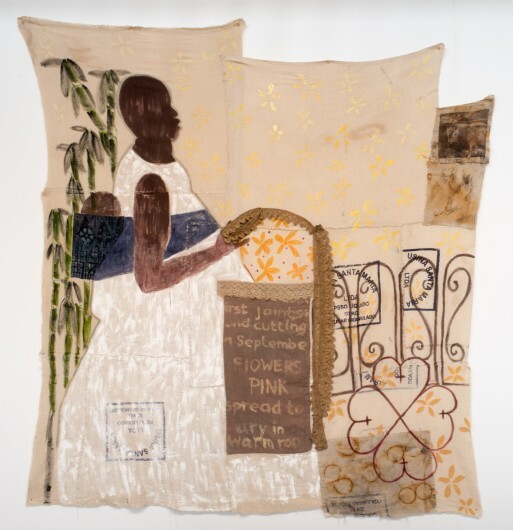 Through her work she examines the echoing legacy of the colonial era and the assimilation of African peoples and cultures into the New World. The piece included in this show, entitled ‘Rendir’, is a particularly strong example of her understated approach to weaving combined with confident paintwork.